You’re about to buy the most important dress you’ll ever wear, so it’s important to get it right! You’ll want the perfect experience and environment when choosing your dress, but you will also need to think ahead. What happens after you’ve chosen your dress and paid your deposit? Read our guide to ensure you leave nothing to chance and have the best bridal experience possible. 1. Will you be the only bride in the boutique? • Do you want an exclusive, special experience or would you prefer a slightly more ‘high street’ approach? • If there is more than one bride-to-be trying wedding dresses, will you get to see the entire range? • The experience that you have will be quite different from shop to shop. Some boutiques are small and only have one bride at a time out of necessity, while others (like Sass & Grace) have ample space and choose to offer the entire boutique exclusively to just one bride at a time. There are others that can have two or more brides-to-be in at the same time choosing their wedding dress. Consider the kind of experience that you want. 2. What is the boutique and it’s location like? • You’re about to try and find what is, probably, the finest and most expensive dress you will ever wear. You are likely to want to keep the design a well-kept secret until your big day. Consider how you may feel if you’re being fitted for your wedding dress in a high street boutique and somebody you know walks past the window, seeing you in the dress. • What kind of mirror do they have and will you be able to see yourself from all angles? With such pretty backs on many wedding dresses, are you going to be able to see the detail when you are trying them on? Are you going to have to share a mirror if there is more than one bride in the boutique? • Consider the size, facilities and location of your chosen boutique. 3. What are the online reviews like? Don’t just look at the ‘star’ rating. Invest time and have a read of what the real brides have to say. If a boutique gives a really exceptional experience, their brides will go out of their way to let others know. As a result, that boutique will have a lot of favourable online reviews. 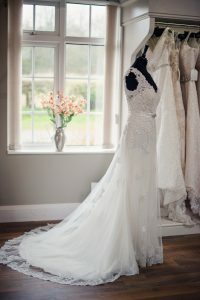 You will spend quite a few hours in your wedding dress shop, choosing and then having your dress fitted, so it’s wise to devote a little time to reading these reviews. It’s probably the only truly impartial view that you will get from a cross-section of brides that have been through every step of the journey. It should give you a realistic idea of what you can expect and it will help you to choose the boutiques that you would like to visit. 4. Do they have a large and varied range of dresses? • What’s your budget? Does the boutique stock a range of dresses from designers that are within your budget? • What’s your style? From boho bride to city chic and pretty princess, does your chosen boutique have dresses that match your vision? 5. Is there parking available? If you choose a busy city centre boutique, leave enough time and take change for parking. It’s also important to think about if you will be able to park closely when you pick up your dress. What if it’s raining and you need to dash to the car with your wedding dress? 6. Does the boutique offer in-house alterations? There are many important factors to consider when planning for alterations. Even with a made to measure dress, it’s likely some alterations will be needed – if only just a bustle to enable you to tuck your train up so you can dance the night away! Does the boutique offer alterations in-house or do you have to take your dress elsewhere? What does the seamstress charge? Can you view a price list? Do the alterations take place in front of the main mirror or in the main dressing room? Will the bridal consultant who sold you the dress be involved in your fittings to ensure continuity? Does the boutique add a percentage to the seamstress’ costs or do they charge the seamstress to work with them? 7. Does the boutique offer to store your wedding dress for you? What happens when your dress arrives? Imagine taking it home and your groom stumbling across it! With most brides shopping for their dress well in advance of their big day, there can be months of storage needed. Does the boutique offer this service and if so, do they charge for it? 8. Does the boutique charge for any extras? Will you be given a dress bag and a sturdy hanger when you pick up your dress? Does the boutique charge for steaming your dress? It’s wise to check these things so there are no surprise charges for you. 9. Does the boutique stock accessories and bridesmaids’ dresses? • Does the boutique stock a wide range of accessories such as veils, hair accessories, shoes and earrings? They all go hand in hand to complete your look for the big day. It’s helpful to be able to try various options with your dress and experiment a little. • Think about your girls too! Will you be able to get bridesmaids’ dresses and flower girl dresses from your chosen shop? This can make fittings easier for you all, and is also a lot of fun! 10. Does the boutique get paid for recommending other suppliers? Word of mouth is really important in the wedding industry and many brides will ask for recommendations. You need to ask if suppliers are recommending other suppliers because they think they are great at their job, or is it because they are getting paid a fee for every booking? Here at Sass & Grace we offer an experience as individual as you. Get in touch to discuss how we can help you choose your perfect wedding dress. We’d love to hear from you.